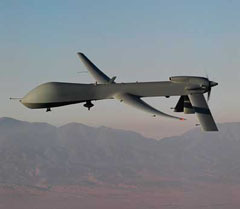 There’s been a lot of chatter over the past week regarding the alleged breach of U.S. Military unmanned aerial vehicles, or at least the networks that they use to transport video streams back to Operation Command Centers in Nevada, or wherever their 19-year old operators and joysticks are positioned. The media have speculated that a virus, introduced from external media penetrated critical networks and was doing bad things. The Government has done its best to misinform and parry, suggesting (and confirming in some way?) that whatever malware did make its way onto its networks is just a nuisance. It was even suggested that the malware was the military’s own, a weapon that somehow escaped the labs. Of course, the Department of Defense doesn’t comment on classified networks, so there’s a good chance we’ll never know the real story. The real question we should be asking is, who cares? I don’t mean to sound glib, but if Uncle Sam says it’s not a problem, maybe it’s not? After all, even if video streams from Unmanned Aerial Vehicles (UAVs) were intercepted, intended targets likely wouldn’t have time to escape before they were made into Afghani pottery anyway, so what’s the big deal? Perhaps, you say, the enemy is collecting intelligence on UAV flight patterns, so that it can predetermine and thusly avoid detection. Perhaps. Or perhaps this story is more important to the media than it is to the masses? Not unlike the incessant droning (sorry) on about malware being delivered to Android-based phones these days. It’s a [nearly] proven fact that over 10% of Android applications do things we don’t want them to do, whether they’re harmlessly hijacking GPS coordinates and personal information to push personalized ads to your browser or they’re outright malware stealing online banking credentials. Here’s the thing – people don’t care. Androids – and their applications, stuffed with privacy-violating “features”, are flying off the shelves. And when will it be time to start vulnerability scanning our cars? We’ve already seen Subaru Outbacks compromised using integrated Wi-Fi, and many vehicles braking systems are vulnerable to attack. And let’s face it – OnStar is a mass botnet just waiting to happen. Don’t look for the “Hardened Security Vehicle” checkbox at your local auto dealer – they don’t care either. Perhaps the Department of Defense is giving us the cold shoulder because they’re a little embarrassed. Perhaps they’ve declassified this information because it’s helpful for the information security community. Or perhaps it’s because redirection and confusion is all part of their Computer Incident Response Team (CIRT) procedure. Or perhaps they’re just teaching us a lesson. If we can care so much about a remote control airplane flying over a desert 7,000 miles away that we’ve never seen and will never have any effect whatsoever on us, why can’t we care about the stuff we use every day?